This new work by Nicholas Arroyave-Portela is like an epic poem where the raw material is clay instead of words, clay that is sensuous and alive, modelled and moulded, pressed, marked, stretched, cut and smoothed. Embedded within these clay forms are images, myths and metaphors that interweave with one another so that everyone will be able to find details - shapes, textures, juxtapositions - to trigger memories and stimulate ideas. They hover on the borderlines between categories, between abstraction and representation, between the fine and applied arts, and they need to be considered from different perspectives and understood on different levels. They are in some ways private and personal, in other ways universal. They engage with ideas of time and space, history and geography, with life, love, journeys and genealogies, with what it is to be human in a changing world. In a year when there have been serious earthquakes in Haiti, Chile and China, and when, at the time of writing, the European skies remain empty of planes because of a volcanic eruption in Iceland, it is peculiarly appropriate that a central theme in this work is geology. The layers of clay present us with a primeval world of geological strata, earth movements, shifting tectonic plates and volcanic eruptions. The subtle colours of the thick slips suggest the blending of geological layers over time to create the graded tones of desert sands and mudflats, while the ribbed and rippled surfaces are like the work of water and ice on hills and continents. Untitled 1, could be an image of the moon, with faint traces of the points at which once-liquid rock had boiled up from below the surface like bubbles of hot chocolate. Arroyave-Portela said of, After the Impact, that he had been particularly impressed by photographs of the surface of the moon scarred by the impact of an asteroid, but the strength of this work is precisely that the possibilities are multiple: yes, it has the qualities of a lunar landscape, but it could also be the epicentre of an earthquake, with the shockwaves spiralling outwards, or, on a more human scale, an exploding target seen through the sights of a gun. There is a satisfying correspondence between this sort of macro-geology and Arroyave-Portela's technique. Somewhat unexpectedly, the starting point for this body of work is the potter's wheel: he begins by throwing pots and then cuts and models them to form the different sections and surfaces, opening out circular volumes to expose the whole. This is in a sense what the earth has done over the millennia: thrown the inside out, turned and flipped its crust. And this in turn is closely paralleled by the way in which geologists, cosmographers and geographers have to cut the world open and flatten it out in order to display all its various parts on a single map. The oval format is among the simplest of these world-map projections which is why, Untitled 2 and in, My father's migration route from Argentina to Colombia in 1941 as a fragmented piece of global history, are immediately recognisable as maps of the surface of the whole earth. This mapping convention dates back to Ptolemy but in the early sixteenth century it took on a new urgency as European sailors brought home evidence of the vast unsuspected landmass of the Americas and there was increasing demand for information about the earth's territories. Martin Waldseemüller's famous map (more heart-shaped than oval in this case) entitled Universalis Cosmographia of 1507 was the first to label a fragment of coastline in what is now north-eastern Brazil 'America'. 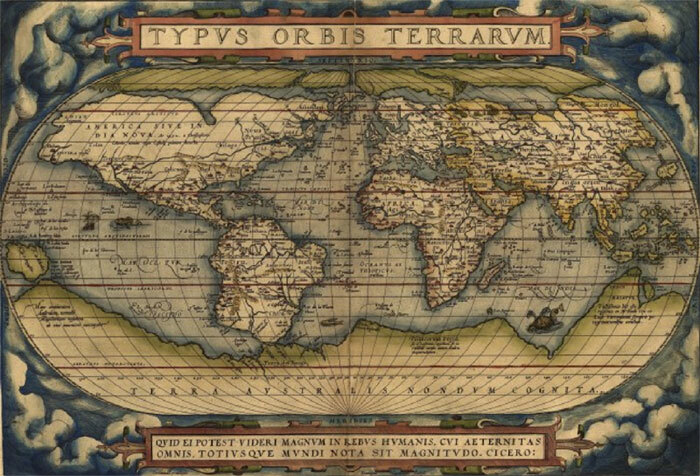 By 1570, when Abraham Ortelius first published his phenomenally popular atlas, the Theatrum Orbis Terrarum, his oval-shaped map of the world included the whole of North and South America, their forms identifiable if not yet entirely accurate. The way the sea is darker around the coastlines of the Ortelius map suggests shadows, as if the edges of the land project out over the sea. Arroyave-Portela's My father's migration does the same in three dimensions: the fragments and flakes of curling clay do indeed float out over blue water and cast real shadows (or perhaps we are looking at different layers of cloud in a blue sky?). These landmasses do not correspond to the familiar shapes of the continents, even as represented in Ortelius, but by their very unfamiliarity in the familiar world-map format they suggest an alternative aspect of the world, one buried beneath the surface or deep in time. And just as in the geological substrata of tectonic plates or the ancient supercontinents of Pangaea, Laurasia and Gondwana of 200 million years ago, here in My father's migration there are already traces of the future: an embryonic Europe and South America are visible within the surface of the clay, turning worlds of turned clay. Ideas of great antiquity, of the instability of continents and the shifting skins of the lower and upper mantles of the earth recur in most of these pieces. Discovering Latin America, is another world map-type but with layers and cracks and fissures, and again, emerging from the substrata, the outlines of South America. Untitled 1, also has a South America-like shape but this time as negative space between the layers suspended around it, like a sea between continents. Looking at these contrasting textures it is easy to see why in indigenous American cultures the earth's surface is often thought of as the back of a monster saurian swimming in the primordial sea, the rough warts and scales of its skin the geological formations of mountain ranges, valleys, rivers and plains. For the Maya the turtle served as a metaphor for the time-space continuum that makes up the universe: the turtle was both a model of the circular world, and of the circular calendar wheels of time. Arroyave-Portela's work similarly deals with space and time and, like the Maya turtle-as-world image, it invites big shifts in focus, where the universal and the individual are mutually interdependent metaphors. As the overall title of the series, Todo sobre mi padre, indicates, all this work refers, in different ways, to Arroyave-Portela's father, whom he remembers as "Dr Fernando". A distinguished and charismatic Oxford-based psychiatrist, Fernando Arroyave-Portela's life was cut short in 1987 at the age of 53, following an unsuccessful heart-transplant operation. His uncommon death was matched by an uncommon early childhood. He was born in Spain in 1934, son of a Colombian, Ezequiel Arroyave Roldán, who had come to Spain to pursue post-graduate studies in medicine at the University of Cadiz, and Mari Carmen, daughter of the rector of the Medical Faculty. Ezequiel, however, returned to Colombia before the birth of his son. It was only seven years later, in 1941, after Mari Carmen had taken the young Fernando to Argentina to escape the aftermath of the civil war in Spain, and when Ezequiel travelled from Colombia to collect them, that father and son met for the first time. Fact may be stranger than fiction but transforming the fragments of strange facts that comprise an individual life into something that will reverberate with those who know nothing of the person or life in question is what art can do. It is what Arroyave-Portela's My father's migration route from Argentina to Colombia in 1941 as a fragmented piece of global history does: these fragments of clay, these unfamiliar continents, pockmarked with craters and scarred with reefs and river beds, are a sort of creative re-imagining of his father's travels. And they are also a record of the artist's personal journey of exploration into his memories of his father, and of his own sense of identity. What does it mean to be born in Oxford to Colombian parents, to be someone who comes into the bizarre 'White Other' category on UK government questionnaires about ethnicity, someone whose childhood Christmases and summers were spent in Spain and Colombia, and whose father's life sounds like the storyline of a David Lean film or a García Márquez novel? In his personal statement about this work Nicholas Arroyave-Portela tells of how as a child, when asked where he was from, he had no simple answer, and that the sense of confusion about where he belonged was amplified after his father's death. These pieces take up the challenge of this question but the answers need to be approached from different directions. During this year, 2010, many Latin American countries, Colombia included, are celebrating the bicentennial of independence from Spain. This was not, of course, a quick or clean process. As Simón Bolívar's dream of replacing the at least part of the vast Spanish Empire of the Americas with a united republic of Gran Colombia faded, as rivalrous factions fought for control of different territories and the region began to break up into the countries we know today, each had to embark on forging a distinct national - and nationalist - identity. Arroyave-Portela's fragmented continents acknowledge this historic struggle while also bringing it up to date. The question of identity in Latin America is very much alive, at a national and regional but also at a personal level. Latin Americans share a history of conquest and colonisation involving the imposition of foreign languages, culture and religion. They share the shameful history of the oppression of the indigenous majority by European minorities; they have suffered unduly from repressive governments, from extractive economies and vulnerability to foreign interference. There are those who argue, and with some justification, that the question of identity in Latin America has been exaggerated, or distorted, or is now simply irrelevant in a globalised world, but it is precisely because of the globalised world that the issue remains alive, in Latin America as elsewhere. In practice, for many people, globalisation means migration, and migration, for whatever reason, means that families are divided: they become, in Arroyave-Portela's words, 'fragmented pieces of global history', and for them the issues of who they are and where they belong remain very immediate. Arroyave-Portela's own solution is to accept a 'multiplicity of identities'. In, Who am I? Flags, territories and frontiers there is, as the subtitle implies, no simple answer, but the many layers and levels within the work do suggest ways forward. This is still a world map of sorts, with continents divided by oceans, with boundary-like folds and striations that run behind the mountainous landmasses but which sometimes protrude through as if echoes of an older era, or of one yet unborn. But this is no longer so explicitly a map. Here, because the continent-like strips stretch from top to bottom, they suggest that what we are seeing is not the whole but just a part. If we adjust our focus from conceptual geography to human vision, this piece can be read as a patch of drying mud, the surface cracking away from the moist layer below, or a close-up of the peeling bark of a London plane tree, or of a reptile sloughing its skin: in each case there is new life below the surface. Other works suggest small details enlarged rather than large vistas reduced. In .... was here the words are drawn into a surface that has a life of its own; not like sand or clay, where the letters would erase the underlying ridges, but like a tattoo or brand on rough but resilient skin. All the things you did to me is even more like fragments of skin: scarred, cut, scratched, wrinkled, bruised and peeling, but also tenderly mended, grafted and bandaged. Today Arroyave-Portela counts east London as his adopted home and says he is comfortable with his Britishness but these works testify to the struggle to define what this might mean. Perhaps not surprisingly, among the layers of clay and the layers of meaning several pieces make reference to the Union Jack. This is most obvious in 'an archeological version of myself' where the centre of the flag has been torn away, the surface behind cut open and below this, faintly visible, the South American continent in shallow relief with lines linking Argentina and Colombia with Spain and the UK. Here the composite nature of the flag (as of the United Kingdom) is emphasised by the way the elements are treated differently: the remnants of the arms of the cross of St George are corroded through in places like pieces of rusty iron, while the fragments of the flags of St Andrew and St Patrick appear more deliberately defaced, splattered with paint or bleach. In 'My father's migration routes as an open wound' the blotches of soft pinks, greens and greys are like army camouflage, pointing up the inevitable association of flags with war, exposing, in effect, their true colours. In these convergent yet dissimilar worlds, these faded, ragged flags, where do individual loyalties lie? In another piece 'Home,Hogar', again made up of layers of map and flag, a faded and blood-stained Union Jack forms the backdrop to a segmented globe. Buried amongst these various layers of the national and the global we can make out the words home and hogar ('home' in Spanish), the one pressed into the surface, the other applied in relief, pointing to personal tensions between possible identities. Transitions, translations, migrations. These pieces take us on journeys across continents, through time, under the skin, into the mind, between meanings, beyond conventional artistic forms and categories, and out to new worlds. La nueva obra de Nicholas Arroyave-Portela es como un poema épico donde el material primario, en vez de palabras, es arcilla; arcilla que es sensual y viva, modelada y moldeada, comprimida, marcada, estirada, cortada y pulida. Al interior de estas figuras de arcilla podemos encontrar imágenes, mitos y metáforas que se entretejen entre sí permitiéndonos encontrar detalles -configuraciones, texturas, yuxtaposiciones- que activan nuestras memorias y estimulan ideas. Ellas se encuentran suspendidas sobre las fronteras que existen entre categorías, entre abstracción y representación, entre las bellas artes y las artes manuales, y necesitan ser consideradas desde diferentes perspectivas y entendidas en diferentes niveles. Ellas son, de muchas maneras, privadas y personales, pero también universales. Nos remiten a ideas sobre el tiempo y el espacio, la historia y la geografía, la vida, el amor, viajes, genealogías; nos hacen pensar que nos hace humanos en medio de un mundo en constante cambio. En un año donde han ocurrido tres serios terremotos en Haití, Chile y China y, en el momento de la escritura de este texto, los cielos Europeos se encuentran vacíos gracias a la erupción volcánica en Islandia, es peculiarmente apropiado que un tema central de este trabajo sea la geología. Las capas de arcilla nos presentan un mundo primigenio compuesto por estratos geológicos, movimientos de tierra, placas tectónicas en desplazamiento y volcanes en erupción. Los sutiles colores de los engobes sugieren una mezcolanza de capas geológicas en el tiempo que crea tonos matizados de desiertos y bahías enlodadas. Al mismo tiempo, las superficies acanaladas y onduladas parecieran ser el resultado del paso de agua y hielo en montañas y continentes. Untitled 1, podría ser una imagen de la luna que nos muestra los débiles trazos dejados por el proceso que alguna vez llevó a la roca líquida a hervir debajo de la superficie, como las burbujas en un chocolate caliente. A propósito de After the Impact, Arroyave-Portela dijo que había sido impresionado, particularmente, por fotografías de la superficie de la luna marcada por el impacto de un asteroide; sin embargo la fuerza de este trabajo radica en que, precisamente, las posibilidades son múltiples: si, tiene las cualidades de un paisaje lunar, pero también podría haber sido el epicentro de un terremoto, con sus ondas expansivas abriéndose en espiral, o a una escala humana, un objetivo explotando visto desde la mira de un arma. Existe una correspondencia entre esta especie de macro-geología y la técnica de Arroyave-Portela. Sorpresivamente, el punto inicial para este corpus de trabajos artísticos es el torno del ceramista: el comienza por crear vasijas que luego son cortadas y moldeadas para crear las diferentes secciones y superficies de su trabajo, abriendo volúmenes circulares para exponer su totalidad. De alguna manera, esto es lo que la tierra ha hecho a través de los milenios: lanzar el adentro hacia afuera, cambiando y mutando su corteza. Esto, a su vez, es bastante parecido a la manera por la cual geólogos, cosmógrafos y geógrafos cortan y abren el mundo para así mostrar todas sus partes en un mapa sin relieves. El formato ovalado ha sido una de las formas más simples para proyectar esta idea, es por eso que Untitled 2 y , My father's migration route from Argentina to Colombia in 1941 as a fragmented piece of global history, son inmediatamente reconocibles como mapas de la superficie de la tierra. Esta convención se remite a Tolomeo, pero fue al principio del siglo diez y seis que esta representación se volvió más urgente, ya que los marineros Europeos traían evidencia de la existencia de la gran e inospechada tierra de las Américas y, al mismo tiempo, aumentaba la demanda de información sobre los territorios de la tierra. El famoso mapa de Martin Waldseemüller (más con la forma de un corazón que de un óvalo en este caso) llamado Universalis Cosmographia de 1507, fue el primero en nombrar un fragmento de costa, en lo que es hoy el norte de Brasil, como 'America'. En 1507, cuando Abraham Ortelius publicó su muy popular atlas, el Theatrum Orbis Terrarum, su mapa oval del mundo incluía la totalidad de Norte y Sur América, sus formas claramente identificables si no completamente precisas. En el mapa de Ortelius, el océano tiende a oscurecerse entre más cerca se encuentre de las costas sugiriendo sombras, como si los bordes de la tierra se proyectaran sobre el mar. My father's migration de Arroyave-Portela logra algo similar en tres dimensiones: los fragmentos y escamas de la arcilla curvada parecen flotar sobre aguas azules y proyectan sombras reales (o tal vez estamos mirando diferentes capas de nubes en un cielo azul?) Estas masas de tierra no corresponden a las formas familiares de los continentes, ni siquiera según la representación de Ortelius, pero por su propia extrañeza dentro del mundo familiar del formato del mapamundi, sugieren una realidad alternativa del mundo, sepultada bajo de la superficie, o enterrada en las profundidades del tiempo. Y, tal como el substrato geológico de las placas tectónicas de los antiguos supercontinentes de Pangaea, Laurasia y Gondwana de hace 200 millones de años, en My father's migration, ya existen trazos del futuro: unas embrionarias Europa y América del Sur son visibles a través de la superficie de la arcilla, un mundo girando de arcilla torneada. En estas piezas, son recurrentes ideas de gran antiguedad, sobre la instabilidad de los continentes y los cambios en la piel de los mantos bajos y altos de la tierra. Discovering Latin America, es otra especie de mapamundi pero con capas, rupturas y fisuras. De nuevo, emergiendo del substrato, la encontramos la silueta de Sur América. Untitled 1, también presenta una forma similar a Sur América pero esta vez como un espacio negativo entre las capas suspendidas al rededor; como un océano entre continentes. Al mirar y contrastar estas texturas, es fácil ver porqué ciertas culturas indígenas Americanas pensaban la superficie de la tierra como la espalda de un monstruo saurio nadando en el océano primordial, sus duras verrugas y escamas en su piel, las formaciones geológicas de cadenas montañosas, valles, ríos y llanos. Para los Mayas, la tortuga servía como metáfora para la continuidad entre el tiempo y el espacio que hace parte fundamental del universo: la tortuga era, simultáneamente, un modelo del mundo circular y del calendario circular de las ruedas del tiempo. Similarmente, el trabajo de Arroyave-Portela también trabaja con nociones del tiempo y del espacio y, como la imagen Maya de Tortuga-como-mundo, nos invita a cambiar nuestro énfasis, a entender que lo universal y lo individual son metáforas mutuamente interdependientes. Como lo indica el título general de la serie, Todo sobre mi padre, todo este trabajo se refiere, en diferentes maneras, al padre de Arroyave-Portela quien el recuerda como "Dr. Fernando". Siendo un distinguido y carismático psiquiatra basado en Oxford, la vida de Fernando Arroyave-Portela fue interrumpida en 1987, a los 53 años, como resultado de una operación fallida de transplante de corazón. Su muerte poco convencional fue reflejada por una niñez también fuera de lo común. El había nacido en España en 1934. Fue hijo de un Colombiano, Ezequiel Arroyave Roldán, quien había venido a España persiguiendo sus deseos de estudiar un posgrado en medicina en la Universidad de Cadiz, y de Mari Carmen, hija del rector de la facultad de medicina. Ezequiel, sin embargo, regresó a Colombia antes del nacimiento de su hijo. Fue Siete años después, en 1941, luego de que Mari Carmen llevara al joven Fernando a Argentina en aras de escapar las secuelas de la guerra civil Española, cuando Ezequiel viajó desde Colombia a recoger a su familia, que el padre y el hijo se conocieron por primera vez. Los hechos pueden ser más extraños que la ficción. El arte puede permitir la transformación de fragmentos de hechos extraños, el compendio de la vida de alguien, en una experiencia que aluda a aquellos que no saben nada sobre la persona o vida en cuestión. My father's... de Arroyave-Portela, logra, precisamente, este objetivo. Estos fragmentos de arcilla, estos extraños continentes, marcados por cráteres y heridos por el paso de los ríos, son una especie de re-imaginamiento creativo del viaje de su padre. Al mismo tiempo, también son un récord del viaje personal del artista dentro de las memorias de su padre y de su propio sentido de identidad. ¿Qué significa haber nacido en Oxford, tener padres Colombianos, ser alguien que cabe dentro de la extraña categoría de "Blanco Otro" en cuestionarios oficiales sobre etnicidad en el Reino Unido, alguien que pasó sus navidades y veranos en España y Colombia, y quien su padre se asemeja más a un guión para una película de David Lean o una novela de García Márquez? En su "personal statement" sobre sus obras, Nicholas Arroyave-Portela nos cuenta como, cuando era niño, cuando le preguntaban de donde era, él no tenía una respuesta simple, y que esa confusión había aumentado después de la muerte de su padre. Estas piezas asumen el reto de contestar a estas preguntas, pero sus respuestas necesitan ser aproximadas desde diferentes direcciones. Durante este año, 2010, muchos países Latinoamericanos, incluyendo a Colombia, celebran el bicentenario de la independencia de España. Es claro que este proceso no fue rápido o limpio. Mientras el sueño de Simón Bolívar de unificar parte del vasto Imperio Español de las Américas bajo el proyecto de la Gran Colombia se desvanecía, mientras facciones rivales peleaban por el control de diferentes territorios y la región se fragmentaba para crear los países que reconocemos hoy, cada cual tuvo que intentar formar una identidad nacional -y nacionalista- distintiva. Los continentes fragmentados de Arroyave-Portela reconocen este conflicto histórico y al mismo tiempo lo actualizan y renuevan. La pregunta sobre la identidad en América Latina aún está viva, en un nivel regional y nacional, pero también a un nivel personal. Los Latinoamericanos comparten una historia de conquista y colonización que trajo consigo la imposición de lenguajes, culturas y religiones foráneas. Ellos comparten la humillante historia de la opresión de una mayoría indígena por una minoría Europea; ellos han sufrido indebidamente formas opresivas de gobiernos, desde economías de extracción a vulnerabilidad hacia la intervención directa foránea. Algunos argumentan, y con algo de justificación, que el debate sobre la identidad en América Latina ha sido exagerado, o distorsionado, o que es, simplemente, irrelevante en un mundo globalizado. Pero es precisamente por causa de la globalización que el tema aún vive, en Latinoamérica como en otras latitudes. En realidad, para muchos, la globalización significa migración, y migración, por diferentes razones, significa familias divididas: se convierten, en palabras de Arroyave-Portela, en 'pedazos fragmentados de la historia global', y para ellos el problema de quien soy y a donde pertenezco es de inmensa importancia. La solución de Arroyave-Portela es aceptar una 'multiplicidad de identidades'. En Who am I?Flags,Territories and Frontiers, como el subtítulo lo sugiere, no propone una simple respuesta. Sin embargo, las múltiples capas y niveles dentro del trabajo sugieren una manera para seguir adelante. Esta obra es, todavía, una especie de mapamundi, con continentes divididos por océanos, con pliegues y estriaciones que se asemejan a las fronteras que definen las cadenas montañosas en las placas de la tierra, pero que, a veces, atraviesan la superficie como si fueran ecos de una era antigua, o una sin nacer aún. Pero esto no es tan claro en su mapa. Aquí, debido a que las formas que nos recuerdan continentes son estiradas desde arriba hacia abajo, la obra sugiere que lo que estamos viendo es solamente una parte, no un todo. Si ajustamos nuestro énfasis y lo traemos de la geografía conceptual a escala humana, esta pieza puede ser interpretada como un pedazo de lodo secándose, su superficie resquebrajándose debido al vapor debajo de ella, un acercamiento a la corteza de un árbol pelándose, o a un reptil mudando de piel: en cada caso, existe nueva vida debajo de la superficie. Otros trabajos nos sugieren pequeños detalles agrandados en vez de panoramas reducidos. En ...was here, las palabras han sido dibujadas en una superficie que tiene vida propia; no como la arena o la arcilla, donde las letras borrarían sus delicadas superficies, sino como un tatuaje o un sello en una piel dura y resistente. All the things you did to me esto nos recuerda aún más a fragmentos de piel: con cicatrices, cortes, arañazos, arrugas, golpes, pero también tiernamente reparadas, injertadas y vendadas. Hoy en día, Arroyave-Portela llama al este de Londres su hogar adoptivo y dice que se siente muy cómodo con su "ser-Británico", pero aclara que estos trabajos testifican a una lucha interna por definir lo que esto pueda significar. En varias de sus obras, podermos apreciar, entre capas de arcilla y niveles de significado, el Union Jack. El uso bastante obvio en 'An Archeological versión of myself' donde el centro de la bandera ha sido rasgada, la superficie de atrás cortada, y debajo de ella, escasamente visible en bajo relieve el continente Sur Americano conectado a Argentina y Colombia, a través de líneas, con España y el Reino Unido. Aquí la naturaleza "compuesta" de la bandera (como la del Reino Unido) es enfatizada a través del manejo mismo de la bandera; sus elementos constitutivos tratados de diferentes maneras: lo que queda de los brazos de la cruz de San Jorge ha sido corroído en lugares como hierro oxidado, mientras fragmentos de la bandera de San Andrés y San Patricio aparecen más claramente desfiguradas, manchadas con pintura o lejía. En 'My Father's Migration routes as an open wound' las manchas de rosado ténue, verdes y grises, se asemejan al camuflaje utilizado por las fuerzas militares, señalando a la inevitable asociación entre banderas y guerras, exponiendo, en efecto, sus verdaderos colores. En estos mundos convergentes y al mismo tiempo disímiles, las banderas descoloradas y rasgadas, ¿dónde se encuentra la lealtad del individuo? En otra pieza 'Home,Hogar', de nuevo compuesta por capas de mapas y banderas, el Union Jack, manchado por sangre y terriblemente descolorido, crea el telón de fondo para un globo fragmentado. Enterrado entre las varias capas de lo nacional y lo global, podemos leer las palabras home y hogar, una impresa en la superficie y otra en relieve, apuntando hacia tensiones personales entre diferentes identidades. Transiciones, traducciones, migraciones. Estas piezas nos llevan en viajes a través de continentes, a través del tiempo, debajo de la piel, dentro de la mente, entre significados, más allá de las formas y categorías convencionales, hacia nuevos mundos.